The Center for Clinical and Translational Science (CCTS ) is UIC’s hub for clinical and translational health research. 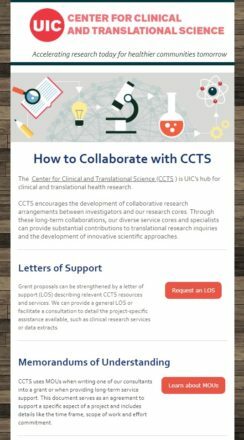 CCTS encourages the development of collaborative research arrangements between investigators and our research cores. Through these long-term collaborations, our diverse service cores and specialists can provide substantial contributions to translational research inquiries and the development of innovative scientific approaches.